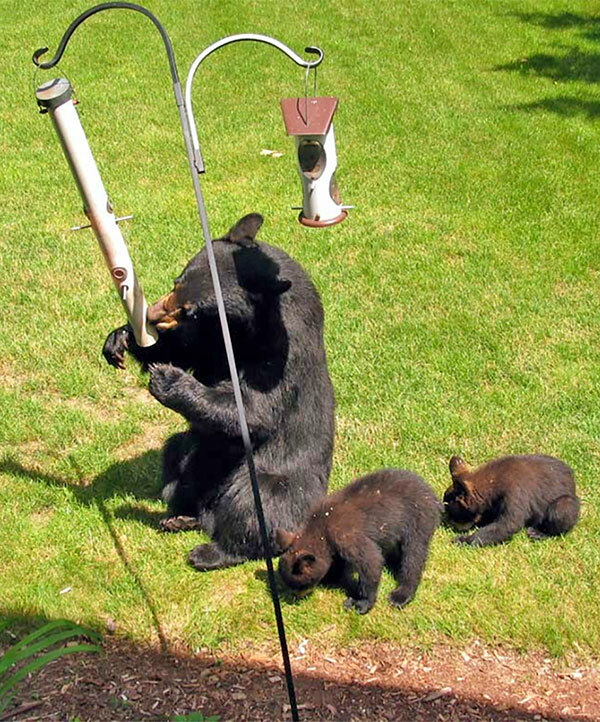 Property owners can help prevent problems with bears by removing food sources like bird feeders now. With longer daylight hours and warming temperatures causing wildlife to start to move, the Michigan Department of Natural Resources advises property owners that now is the time to look around and see if they have items that soon may be attracting bears. Black bears—an “up north” Michigan icon decorating many homes, restaurants and hotels—can be found throughout more than half the state. Spotting a bear tends to draw a lot of interest and attention. Bears find birdseed and suet especially attractive, as they are high-calorie and reliable compared to other plentiful and natural food sources. Bird feeders can draw bears past their natural habitat, where they would normally be enjoying roots of early spring plants and insects in trees and logs. Bears also typically will continue to return to a location once they have found a food reward there. During the spring and early summer, phone calls to the DNR from home and business owners frustrated with bear activity increase. While it is legal to feed birds, property owners may be creating an irreversible safety issue by providing food for bears. “Bears that receive a food reward when around homes, yards and neighborhoods typically lose their natural fear of humans and can become a potential threat to people and their pets,” Keen added. 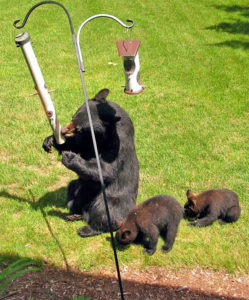 The easiest thing people can do to avoid problems with bears is remove bird feeders during the spring and summer months. With an estimated 2,000-plus adult bears in the northern Lower Peninsula and almost 10,000 in the Upper Peninsula, there are plenty of bears searching for natural food that is plentiful in forests, fields and wetlands. “Many people who live in northern Michigan remove their bird feeders during the spring and summer, but every year the spring sneaks up on us and suddenly, it is now that time of year,” said Keen. Wild animals should be appreciated from a distance. Michigan residents can help their neighborhoods and communities by removing bird feeders and other attractants. Garbage cans, dumpsters, barbeque grills, restaurant grease bins and bee hives also can attract bears to areas people frequent. For your safety, never intentionally feed or try to tame bears – it is in your, and the bear’s, best interest. It is critical that bears retain their natural fear of humans. Learn more about Michigan’s black bears and how to prevent potential problemsby visiting michigan.gov/bear or by watching “The Bear Essentials” video at https://www.youtube.com/watch?v=y6c1c3qw7dg.